"The Hero of San Juan Hill"
Click on the banner above to go to the Theodore Roosevelt homepage at the University of Virginia's Miller Center. 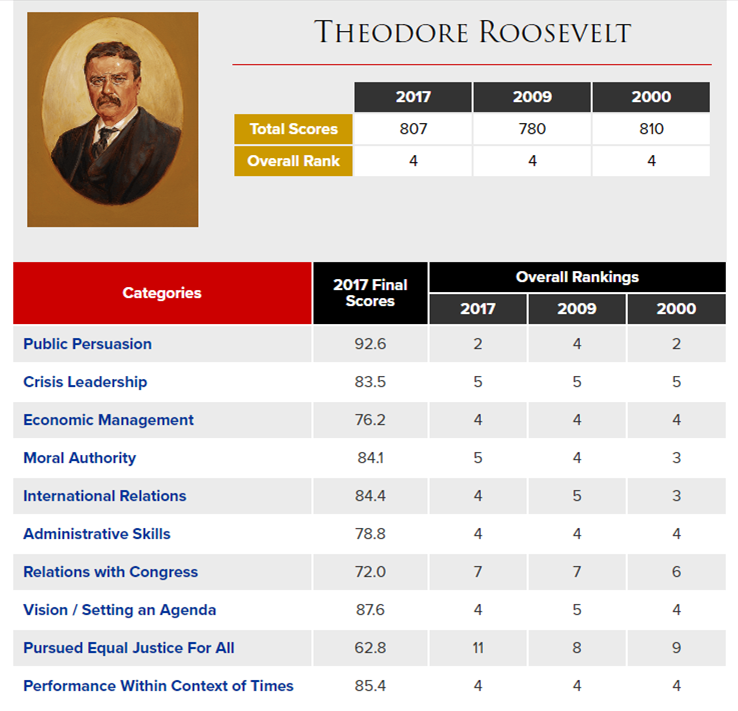 Click on the buttons below for in-depth information about T. Roosevelt's Presidency. Roosevelt was the first President to travel outside of the Continental U.S. while in office. In 1906, he traveled to Panama to observe construction of the Panama Canal that had begun in 1881 and would finish in 1914. Although Roosevelt had been a Sunday school teacher, he believed strongly in the separation of Church and State. While taking the Oath of Office during his inauguration after President William McKinley's assassination, he did not swear on the Bible. When the $20 gold coin was designed in 1907, the words "In God We Trust" were not present. In a letter written by Roosevelt, he said it was irreverent to have the words printed on the coins because the money was used to buy worldly goods and services. After public outcry, Congress passed legislation requiring "In God We Trust" be restored to all U.S. coins upon which it had been previously printed. In 1906, Roosevelt was awarded the Nobel Peace Prize for his role as negotiator in the Russo-Japanese War. He was the first American (and first U.S. President) to win the Nobel Prize. Presidents Woodrow Wilson (1919), Jimmy Carter (2002), and Barack Obama (2009) later won the award. Roosevelt's education was mostly homeschooling by his parents and tutors. He was an avid reader and developed a photographic memory. He was capable of reading an entire page of printed words in the same time as the average person could read one sentence. Roosevelt read a book each morning before breakfast and several more in the evening if he had free time. It was reported that upon reading Upton Sinclair's book The Jungle (that exposed the horrors of the meat industry), Roosevelt exploded in anger, spitting out the sausage he was eating. In 1906, he responded with the Meat Inspection Act and the Pure Food and Drug Act. Roosevelt was a great multitasker, able to dictate letters and memos to two separate secretaries while browsing through a book at the same time. Roosevelt was the first President to be commonly known by his initials "TR". This was later true for Presidents "FDR", "JFK", and "LBJ". Roosevelt was blind in his left eye, the result of a boxing injury he sustained while in office. That's right. A boxing injury he got while President. "Theodore" and "Franklin" Roosevelt share a famous name but were only distantly related: they were fifth cousins. Teddy was more closely related to Franklin's wife, Eleanor, who was his niece. (She was the daughter of Teddy's brother, Elliot.) In fact, when Eleanor married FDR, Teddy was the one who "gave away the bride". Martin Van Buren was a third cousin twice removed to Theodore, and Zachary Taylor was a fourth cousin thrice removed to FDR. Got all that? It was rumored that both Teddy and Franklin Roosevelt had their family crest tattooed on an undisclosed location. Roosevelt officially gave the White House its name. In 1800, John Adams became the first President to reside in the White House after the nation's capital moved from Philadelphia to Washington, D.C. The building was originally referred to variously as the "President's Palace", "Presidential Mansion", or "President's House". The earliest evidence of the public calling it the "White House" was recorded in 1811. A myth emerged that during the rebuilding of the structure after the Burning of Washington, white paint was applied to mask the burn damage it had suffered, giving the building its namesake hue. The name "Executive Mansion" was used in official contexts until Roosevelt established the formal name by having "White House–Washington" engraved on the stationery in 1901. Roosevelt and his six children had more animals at the White House than any other President. The Roosevelt children's family of pets included a small bear named Jonathan Edwards; a lizard named Bill; guinea pigs named Admiral Dewey, Dr. Johnson, Bishop Doane, Fighting Bob Evans, and Father O'Grady; Maude the pig; Josiah the badger; Eli Yale the blue macaw; Baron Spreckle the hen; a one-legged rooster; a hyena; a barn owl; Peter the rabbit; and Algonquin the pony. (Algonquin was so beloved that when the President's son Archie was sick in bed, his brothers brought the pony up to his room in the elevator.) In addition to these, the Roosevelt children also had a garter snake named Emily Spinach (named by Roosevelt's daughter Alice "because it was as green as spinach and as thin as my Aunt Emily"); Sailor Boy the Chesapeake retriever, Jack the terrier, Skip the mongrel, a small black Pekingese named Manchu, and Pete the bull terrier (who sank his teeth into so many legs that he had to be exiled to the Roosevelt home in Long Island!). Roosevelt was the youngest President, assuming the office at the age of 42 after President William McKinley was assassinated. John F. Kennedy was the youngest President to be elected to office. JFK was 43 when he became President. 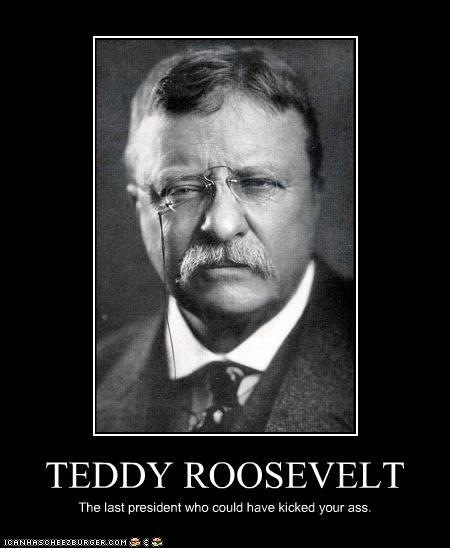 The inspiration for the "Teddy Bear" is believed to have come from a political cartoon about a bear-hunting trip by Roosevelt. As the story goes, Roosevelt went on a bear hunt in Mississippi in 1902. He enjoyed nature and being out in the woods where animals lived. (And what better way to celebrate nature than by gunning down its creatures?!) Because he was the President, the people organizing the hunt wanted to make sure the hunt was successful... and that he wouldn't wind up mauled. After three days of walking, climbing, and riding, no bears were found. Now what? The President's bear hunt would be a failure! The next day the hunt guide and his dogs finally found an old bear. The dogs and guide followed the bear for quite a distance until the bear was tired, at which time the dogs attacked and injured the animal. 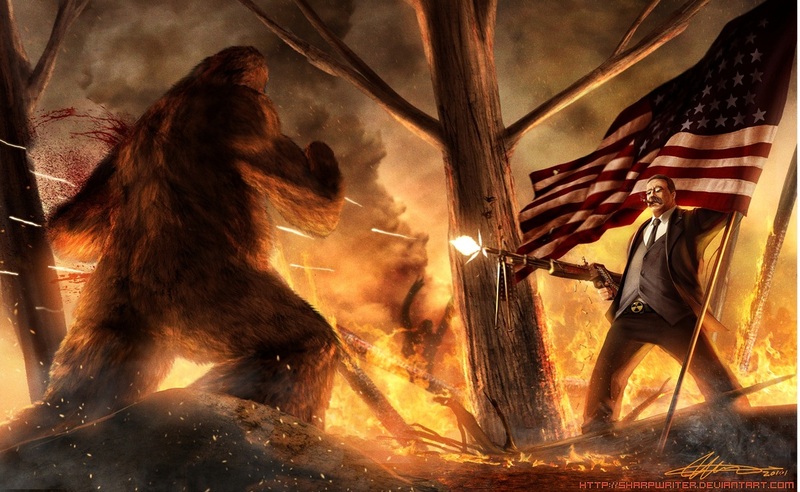 The guides tied the bear to a tree and called for Roosevelt. Here was a bear for him to shoot! Roosevelt arrived, took one look at the bear and refused. No one would shoot this old bear for sport. However, the bear was injured and suffering... so he ordered that it be put down to end its pain (just, you know, not by him). Clifford Berryman, a political cartioonist, heard this story and drew a cartoon showing how Roosevelt refused to shoot the bear. 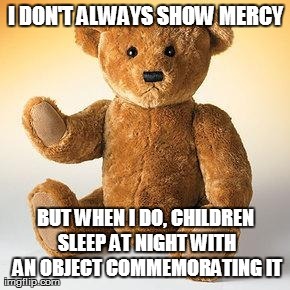 After this appeared in the papers, a shopkeeper named Morris Michtom took two stuffed toy bears which his wife had made and put them in his shop window. He asked for permission from Roosevelt to call these toy bears "Teddy's bears". It was an instant success, and, as time went on, they became simply "Teddy Bears". Roosevelt had always been fascinated by naval history. 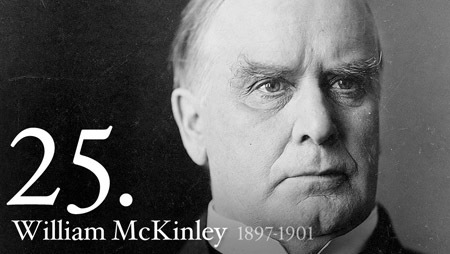 Urged by Roosevelt's close friend, President McKinley appointed Roosevelt to the post of Assistant Secretary of the Navy in 1897. Ten days after the battleship Maine exploded in the harbor of Havana, Cuba, Roosevelt became Acting Secretary for four hours. In that short amount of time, Roosevelt told the Navy worldwide to prepare for war, ordered ammunition and supplies, brought in experts, and went to Congress asking for authority to recruit as many sailors as he wanted, thus moving the nation toward war. Roosevelt was instrumental in preparing the Navy for the Spanish-American War and was an enthusiastic supporter of testing the U.S. military in combat, at one point saying, "I should welcome almost any war, for I think this country needs one." After war was declared on Spain in 1898, Roosevelt resigned from the Navy Department to find volunteers to form the First U.S. Volunteer Cavalry Regiment (made up of cowboys from the Western territories and Ivy League friends from New York). The newspapers called them the "Rough Riders". Roosevelt fretted that the war would be over before he tasted battle. 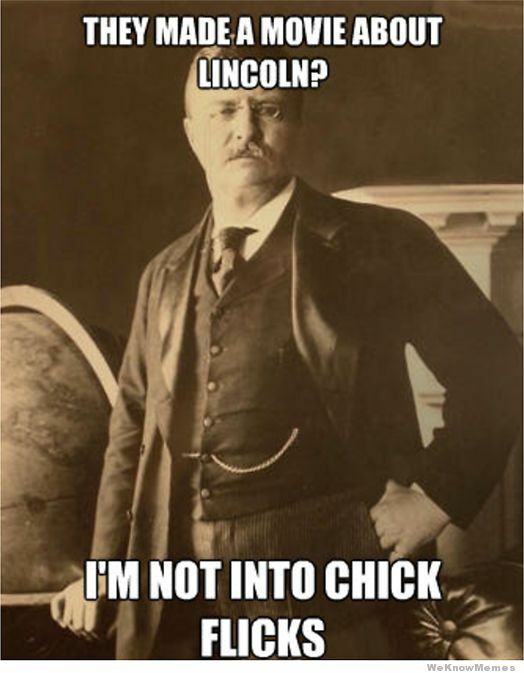 Fortunately for him, this was not the case, and his Rough Riders were shipped off to Cuba to battle the Spanish. Under his leadership, the Rough Riders became famous for dual charges up Kettle Hill and San Juan Hill on July 1, 1898. Out of all the Rough Riders, Roosevelt was the only one with a horse, as the troopers' horses had been left behind because transport ships were scarce. He rode back and forth between rifle pits at the forefront of the advance up Kettle Hill, an advance that he urged in absence of any orders from superiors. He was forced to walk up the last part of Kettle Hill on foot because of barbed wire entanglement and after his horse, Little Texas, grew tired. For his actions, Roosevelt was nominated for the Medal of Honor, which was later disapproved. In 2001, Roosevelt was posthumously awarded the Medal of Honor for his actions. He remains the only President to be awarded America's highest military honor and the only person in history to receive both his nation's highest honor for military valor and the world's foremost prize for peace. Having a bad day? Hardly... On Valentine's Day 1884, Roosevelt lost both his mother and his wife. Roosevelt (25 years old) was at work in the New York state legislature when he was summoned home by his family. He returned home to find his mother, Mittie, had succumbed to typhoid fever. On the same day, his wife of four years, Alice Lee, died of Bright's disease, a severe kidney ailment. Only two days before her death, Alice Lee had given birth to the couple's daughter, Alice. 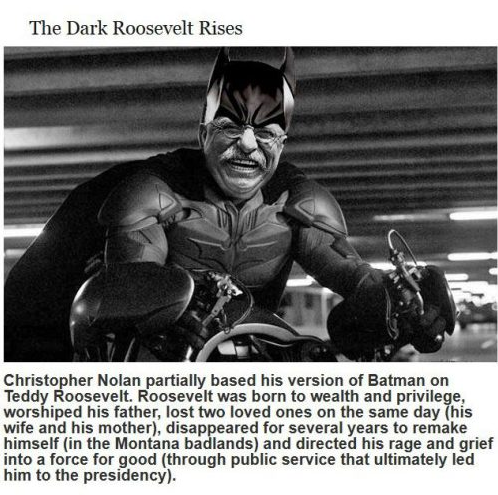 The double tragedy devastated Roosevelt. Burdened by grief, he abandoned politics, left the infant Alice with his sister Bamie, and, at the end of 1884, headed out for the Dakota territories, where he lived as a rancher and worked as a sheriff for two years. After a blizzard wiped out his prized herd of cattle in 1885, Roosevelt decided to return to eastern society. Once back in New York in 1886, he again took up politics and took over raising his daughter. That same year he married his second wife, Edith. The two would go on to have five more children. Before he left office in 1909, Roosevelt hand-picked William Howard Taft as his successor and worked to get him elected. 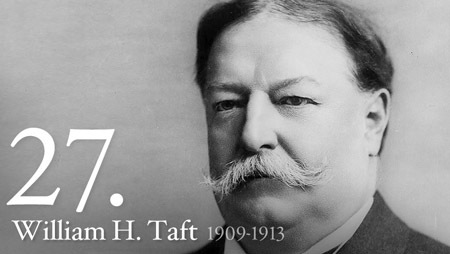 Taft ﻿had served in the ﻿Roosevelt Administration as governor of the ﻿Philippines and Secretary of War. During the Election, Taft vowed to run the country just as Roosevelt had done. But the new administration got off to a rocky start when started dismissing Cabinet members installed by Roosevelt. Roosevelt was miffed at Taft not being consulted on the new appointments. During this time, progressivism was gradually rising from the local and state level to the national level﻿. Increasing numbers of people across the nation supported expanding the role of the Federal Government to ensure the welfare of the people. 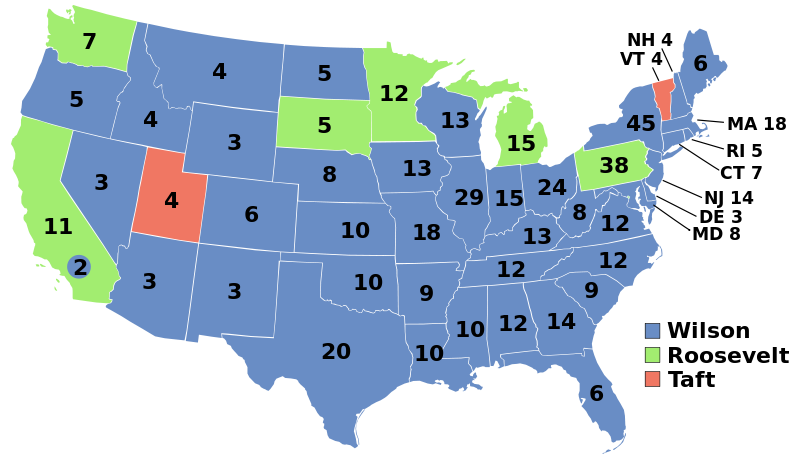 Pressured by the Progressive wing of the Republican Party to challenge Taft in the Election of 1912, Roosevelt weighed his options. Eventually, he decided to throw "his hat into the ring" and run against his former protégé. 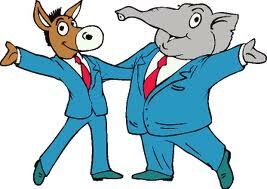 The Republicans met in Chicago in June 1912, hopelessly split over picking Roosevelt or Taft. When Taft was given the nod, Roosevelt and his supporters abandoned the Republican Party and reconvened in Chicago two weeks later to form the Progressive Party. Roosevelt gave a dramatic speech in which he announced that "We stand at Armageddon, and we battle for the Lord!" 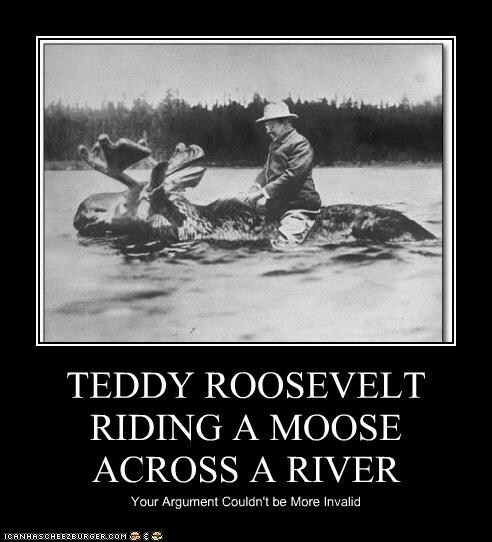 Declaring that he felt "as strong as a Bull Moose", Roosevelt gave the new party its popular name (the Bull Moose Party). 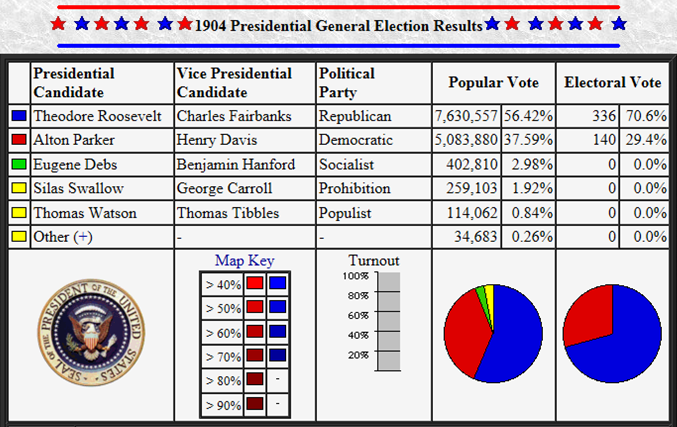 The problem that both Roosevelt and Taft faced was they effectively split Republican/Progressive votes between the two of them, paving the way for a smooth victory for the Democrat's Woodrow Wilson. 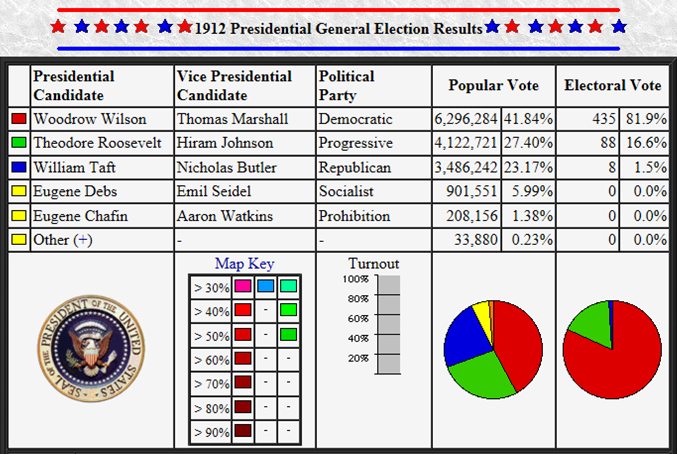 Wilson captured 41.9% of the Popular Vote to Roosevelt's 27.4% and Taft's 23.1%. (If you add the two together, Wilson doesn't win.) In the end, though, much of Roosevelt's platform and Progressive program were enacted during Wilson's Presidency. After Taft's inauguration, Roosevelt traveled in Africa and Europe for more than a year. He then went on a safari with his son, Kermit, where he acquired more than 3,000 animal trophies, including eight elephants, seven hippos, nine lions, and 13 rhinos. After losing the Election of 1912 to Woodrow Wilson, Roosevelt again left with Kermit on a voyage into the jungles of Brazil to explore the River of Doubt in the Amazon region. During the seven-month, 15,000-mile expedition, Roosevelt contacted malaria and suffered a serious infection after injuring his leg in a boat accident. Following his return to the U.S., Roosevelt spent his days writing scientific essays and history books. 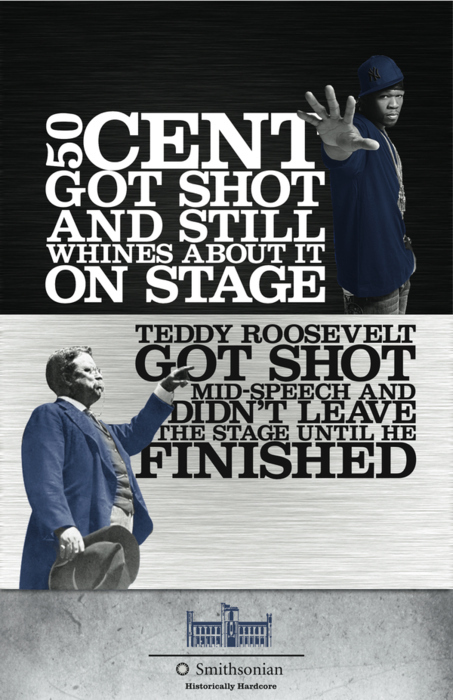 On October 14, 1912, Roosevelt was campaigning in Milwaukee, Wisconsin when a local saloon-keeper shot him. The bullet lodged in his chest after passing through a jacket pocket containing his steel eyeglass case and a copy of his 50-page speech which had been folded in half. 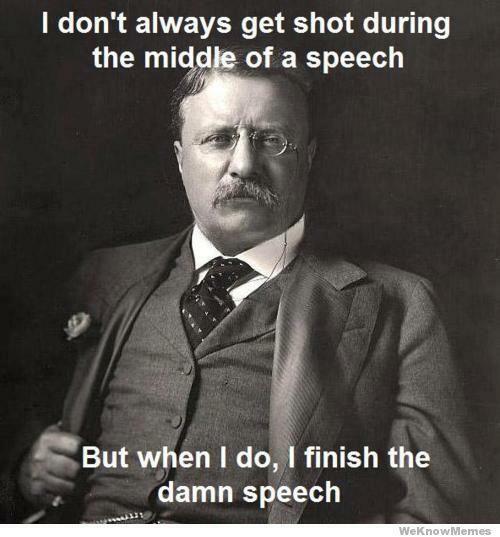 Roosevelt concluded that since he wasn't coughing blood the bullet had not penetrated the chest wall into his lung, so he declined immediate treatment... and gave his 90 minute speech (with blood seeping from the wound into his shirt). 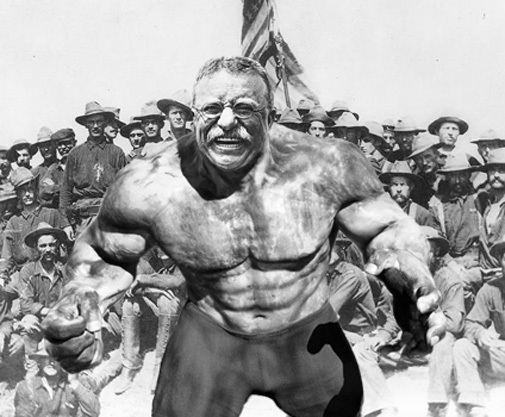 "Ladies and gentlemen, I don't know whether you fully understand that I have just been shot," Roosevelt said, "but it takes more than that to kill a Bull Moose."